Automotive safety and comfort functions, known as Advanced Driver Assistance Systems (ADAS), have become an essential part of modern vehicles. These functions assist drivers in the driving process, providing capabilities such as adaptive cruise control or highway driving mode. To achieve a desired level of performance, the position of the vehicle must be known. Precise positioning supports the vehicle’s systems with planning, executing and monitoring of a particular maneuver. Position determination, or localization, is the estimation of the location, heading, velocity and acceleration of a vehicle with respect to a fixed coordinate system. High-precision GNSS provides an excellent, worldwide, absolute position reference for localization. However, GNSS technology alone has limitations that must be overcome to make it suitable for use in autonomous systems. For instance, GNSS signals may become blocked or lost due to: obstructions such as in urban canyon or tunnels; multipath, where signals are reflected off the vehicle body; or signal interference from other RF signal sources. GNSS correction data and data from other sensors on the vehicle can be used to improve the accuracy and reliability of the vehicle localization solution both globally and with respect to the local environment. To achieve the localization performance, accuracy and integrity required for autonomous vehicles, a multi-system, sensor fusion approach seems to be the most promising. Localization systems will require absolute positioning references like precision GNSS as well as local or relative positioning inputs from inertial sensors, odometers, radar, LiDAR, cameras, infrared and ultrasound sensors. It is clear that no single technology will make highly automated driving possible. Rather, the fusion of the entire vehicle’s sensing technologies will provide the localization accuracy and reliability required. GNSS has revolutionized localization in many applications, from precision survey to agricultural guidance. For autonomous driving applications, localization accuracy of 30 centimeters (cm) or less is required. The single-frequency, auto-grade GNSS receivers that have been used in vehicles up to now cannot achieve this level of accuracy. Multi-frequency GNSS receivers utilizing Precise Point Positioning (PPP) correction techniques can achieve accuracies better than 10 cm. 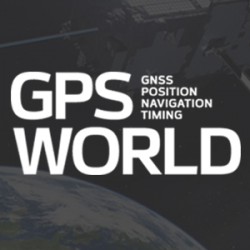 PPP algorithms combine GNSS satellite clock and orbit correction data from a global reference station network with high precision GNSS receiver satellite observations to yield robust sub-decimeter positioning without the need for local base stations. Since the PPP corrections can be delivered via satellite, the solution is ideal for highly automated driving where communications infrastructure is costly and in some areas may not be available. 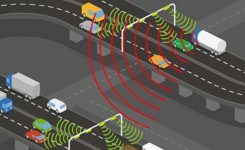 Recent advances in PPP techniques provide robust positioning and the ability to quickly regain full accuracy following a temporary loss of GNSS signals, for instance under foliage or highway overpasses. Figure 1. High-precision / localization with sensor fusion. Occasional instantaneous irregularities and temporary outages of GNSS can be compensated for by incorporating measurements of the vehicle motion from inertial sensors mounted in the vehicle. An advantage of a tightly coupled GNSS-inertial solution is that the low frequency errors inherent to inertial sensors can be compensated for and removed from the solution. As a result, sensor fusion algorithms provide a highly robust and stable localization solution at data rates as high as 200 Hz. Other sensors in the vehicle, such as odometers, cameras or LiDAR, can also give information about the relative motion of the vehicle and can add to the redundancy, reliability and stability of the localization solution. Figure 2. With a tightly coupled GNSS-inertial solution, low-frequency errors can be removed from the localization solution. The brown dots are the GNSS solution, the blue dots are the inertial solution, and the combined colors represent the tightly coupled solution. Antennas play a critical role in achieving precise localization with GNSS. While GNSS antenna requirements differ depending on the application, ideally the antenna should receive only signals above the horizon, have a known and stable phase center that is co-located with the geometrical center of the antenna, and have perfect circular polarization characteristics to maximize the reception of the incoming signals. Highly automated driving applications demand high performance as well as compact size and strong interference rejection. Achieving the required performance amidst these challenging constraints will require innovative new GNSS antenna designs. Autonomous driving will be a reality in the not-too-distant future. Innovation in the suite of sensors and fusion algorithms used for solving the localization challenge will be paramount to making safe and reliable autonomous vehicles. Further, innovation developed for automotive autonomy will support new autonomous vehicle applications in other segments. Siamak Akhlaghi is segment manager for Autonomous Systems at NovAtel. He has 20 years of professional experience working for high-tech sectors with broad experience in inertial sensors and navigation systems.